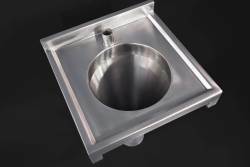 Perfect for emptying and filling pails and for the disposal of bedpan waste, our bespoke stainless-steel slop hoppers and sluices are designed to withstand the rigours of a busy hospital, clinic, care home or veterinary practice. Fabricated from high-quality, ‘304’ food-grade steel, our robust sinks and hoppers meet all current Health & Safety legislation. 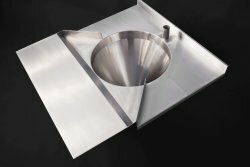 The slop hopper can be supplied as a single, standalone unit, or can be incorporated into a larger sink unit, such as a sluice sink or any other configuration of basin, sink and worktop. 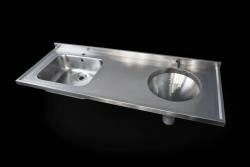 The sluice sink features an integral slop hopper, along with sinks and drainers, as required, to provide a complete sanitary working area for hospital or other healthcare applications. 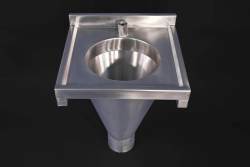 In both the sluice sink and the standalone hopper unit, the hopper features a cone with a flushable rim, to allow for the instant, convenient disposal of organic waste. The unit can be supplied with an integral stainless-steel inlet pipe, to facilitate the attachment of cisterns or direct flushing systems. A large bore waste outlet ensures efficient disposal of waste products. 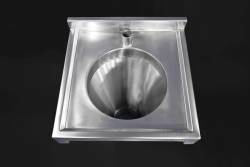 All of our slop hoppers and sluice sinks are fabricated to order in our Nottingham factory – allowing the client to specify the exact size and configuration of unit required. Please click on the relevant section heading for your sector, to find out more. We have more than 50 years’ experience of supplying stainless-steel products to the healthcare industry, from hospitals and clinics to care homes. Our fully-bespoke hoppers and sluices are made from 304 food-grade steel, which meets all current Health & Safety regulations and is naturally antibacterial, to match the stringent hygiene requirements of a healthcare environment. This high-quality metal is also rust- and impact-resistant, can cope with exceedingly high temperatures and will last for decades, with only routine care. 316 laboratory-grade steel is available, for areas where the safe disposal of corrosive chemicals is necessary. As well as hoppers and sluices, we can provide many other products for your healthcare practice – from hand-wash basins and shower trays to stainless-steel cupboards and shelving. Get in touch today, to discuss your requirements. Our slop hoppers and sluices can be used for the easy filling and emptying of mop buckets, or for the disposal of waste from blocked toilets. Featuring a cone-shape hopper to keep splash to a minimum, with a flushing system beneath the rim, they need very little cleaning to maintain the strict hygiene requirements of a washroom. 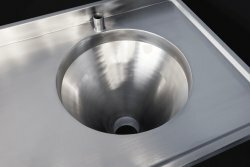 Thanks to our bespoke fabrication service, you can be sure of acquiring the exact product you need for your project: from a simple, standalone hopper (with or without an inlet pipe for the attachment of a cistern or direct flushing system) to a fully-customised sluice sink unit, with work surface and integral sink or hand-wash basin. We use only high-quality, 304 stainless steel for our products – our sluices and hoppers are extremely durable and impact resistant, and will last for decades, making them the cost-effective choice for your project. They also meet all current Health & Safety regulations. Our range features many other products for washrooms, including vanity tops, urinals, shower trays and worktops. Contact us today, to discuss your project. Our slop hoppers and sluices allow the convenient, hygienic flushing away of animal waste. 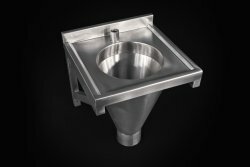 Made entirely to order in our Nottingham factory, these products feature an integral hopper with flushable rim, to keep additional cleaning to a minimum. The hopper itself is cone-shaped, to guard against splash and to facilitate the disposal of organic waste. 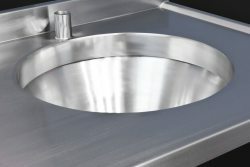 A large bore waste outlet ensures the efficient removal of all waste. Fabricated from 304 steel, the surface is naturally antibacterial – essential in a veterinary surgery, where hygiene is paramount. This metal also meets all current Health& Safety regulations, and is so impact resistant and durable, it will last for decades. 316 laboratory-grade steel is available if needed, for the disposal of chemicals. Our range of products for veterinary surgeries includes benchtops, examination tables, trolleys, and many other items – including made-to-order commissions of unusual items, such as a staircase to allow easy access by larger animals to the examination table. Contact us today, to see how we can help to furnish your veterinary practice.